The CI-202 Portable Laser Area Meter uses advanced laser technology to provide researchers with a precise and convenient method of measuring leaf area. The high-resolution laser scanner, data logger, and display are enclosed in a hand-held self-contained unit. 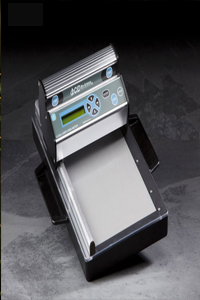 Ideal for field use, the scanner head and palette format base. Researchers can perform non-destructive measurements on the leaves of living plants by simply sliding the scanner over the leaf, enabling collection of data from the same plant, or even the same leaf, throughout its life span. * Measures Area, Length, Width, Perimeter, Shape Factor, ratio. * Built-in data logger stores 8,000 data sets. * Measuring Thickness : 15 mm Maximum. * Measuring Length : 36 cm. * Accuracy : ±1% for samples >10cm2. * Compact, Hand-held Instrument, advanced Laser Technology. * Non-destructive Measurement of samples. * Measure and calculate AREA, LENGTH, WIDTH & PERIMETER, SHAPE FACTOR & ASPECT RATIO. * High resolution of 0.01cm2 with Laser. * In-built data storage (64 KB memory). * RS232C port data transfer facility to computer. * In-built rechargeable battery power. * Measuring Width : 150 mm (15cm) maximum. * Sample Thickness : 25 mm (2.5 cm) maximum. * Accuracy : + 1% for sample > 10 sq. cm.